First, it saves you money. 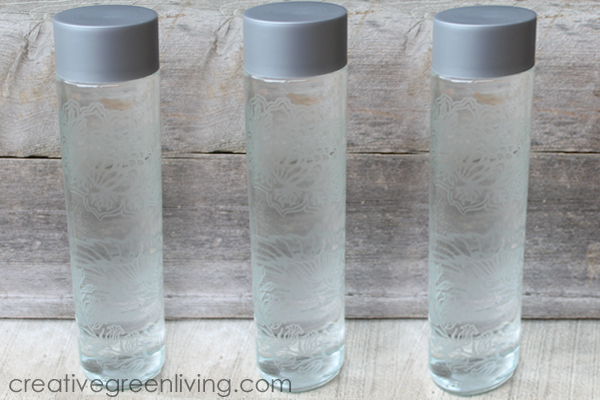 Fancy glass water bottles that you can buy at big box stores often cost upwards of $20. This project lets you turn an empty Voss Water glass bottle that you bought for just $3 into a work of art! Second, it saves the planet. You can use this tutorial to transform any glass water bottle or other glass jar into a beautiful, reusable glass water bottle that can be used many, many times. If you make a bottle you like using and you use it every day for a year, you will have given it 365 more uses than if you had just recycled it after using it once. Like it enough to use it every day for three year and you will have used it more than 1,000 times! When we can reuse the products we buy instead of recycling them after just one use, that is a sustainable act indeed! Third, it helps you drink more water. When you have a water bottle you enjoy using, you are more likely to actually use it! I hope you enjoy this easy DIY water bottle project! 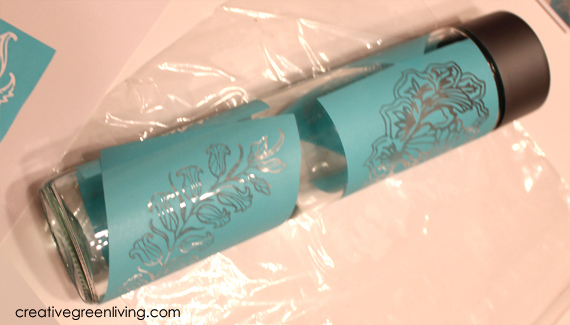 If you make your own recycled water bottle craft, I would love to have you share a photo in the Creative Green Living Tribe on Facebook. Looking for more ways to upcycle glass water bottles? 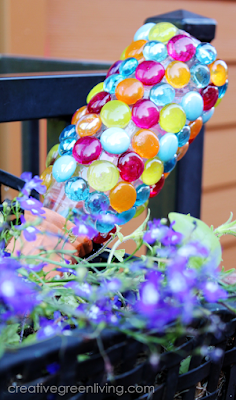 Check out my upcycled glass water bottle craft that turns an empty bottle into a pretty plant waterer! Keep your plants from dying because you are on vacation or just because you are bad at remembering to water them. Get the directions for how to make a vacation plant waterer here. IMPORTANT NOTE: This project will only work on glass water bottles. 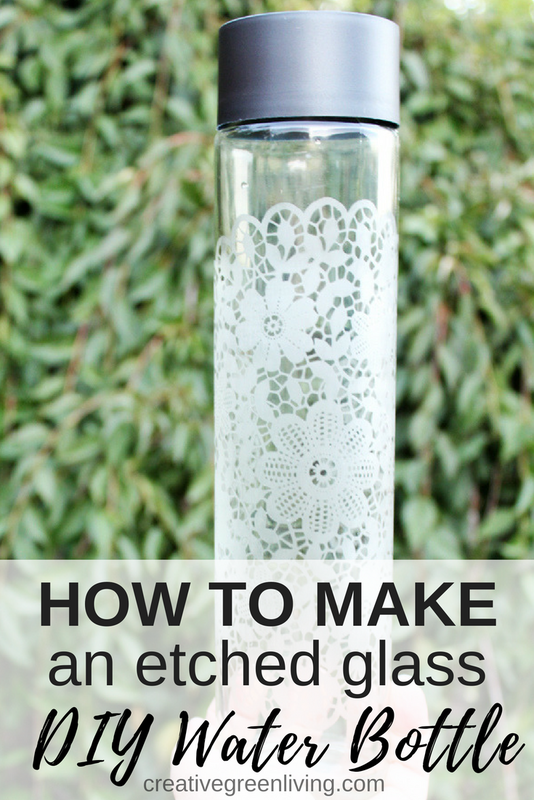 The glass etch cream will not be able to etch a plastic or metal water bottle. Please note: I recommend keeping the lid on the entire time you work with the bottle to prevent paint chips, soap or chemicals from getting inside. The Voss water glass bottles come with both peel-off labels or labels silkscreened on with paint. If your bottle has a painted label, remove it by scratching it off with a razor blade. To do this without scratching the glass, hold the blade at an angle and gently use it to chip away the paint. 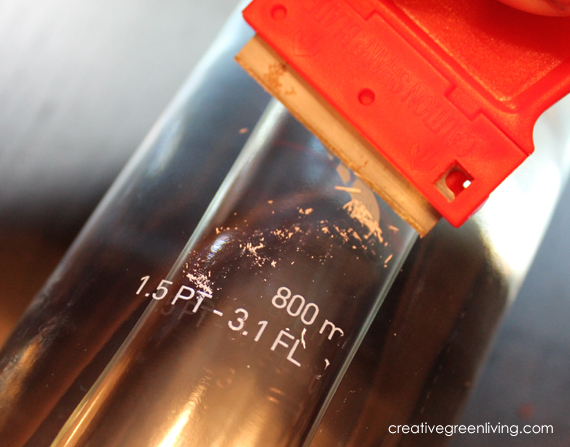 Once the paint is removed, wash the outside of the bottle with soap and water. Check to be sure you removed all the paint and re-scrape problem areas if needed and then re-wash. Set aside to dry. The Martha Stewart silkscreens I used come as one large sheet. 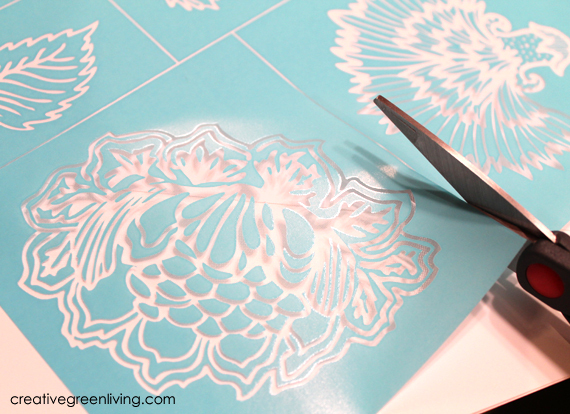 Remove the sheet from the protective backing and cut each individual piece from the sheet, following the lines. 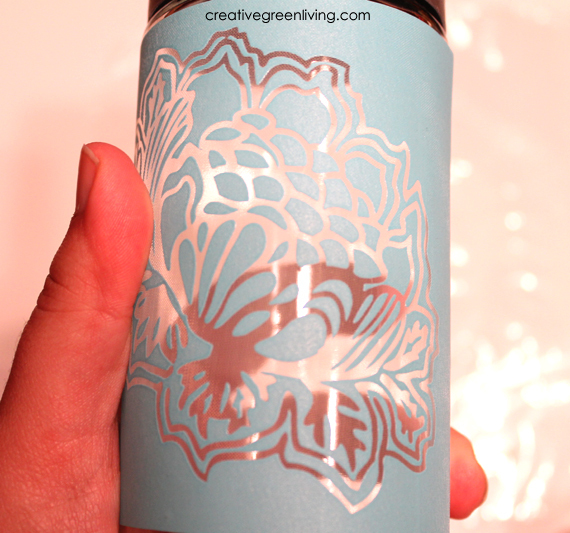 Select a silkscreen and place it on the bottle, rubbing it to be sure it is well adhered with no bubbles or gaps. You may choose to use painter's tape to adhere the edges as well. I live on the wild side and did not use tape. Continue adding silkscreens as desired. I wanted the bottle to be covered in the floral motif, so I added all the large stencils and stopped when I ran out of room. 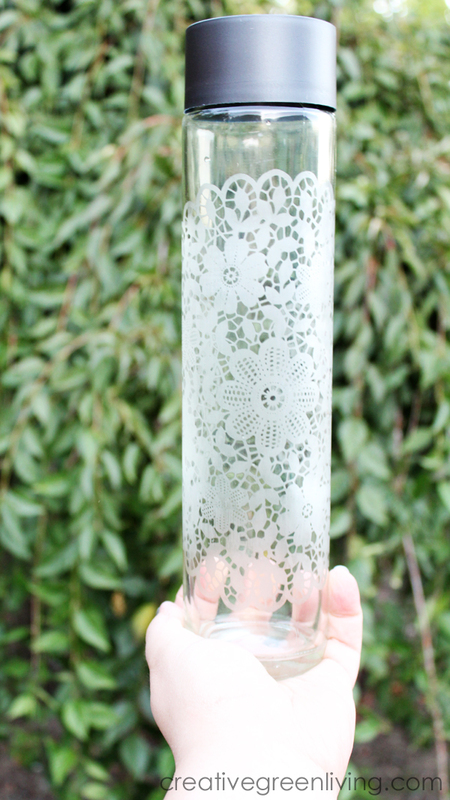 You could also use one large stencil like the large lace doily silkscreen I used in the video above - which will end up covering most of the water bottle by itself. Put on your gloves. Seriously. This stuff is acid capable of eating through glass. You don't want even a tiny bit on your skin. Stand the bottle up on its end and set on a protective surface. 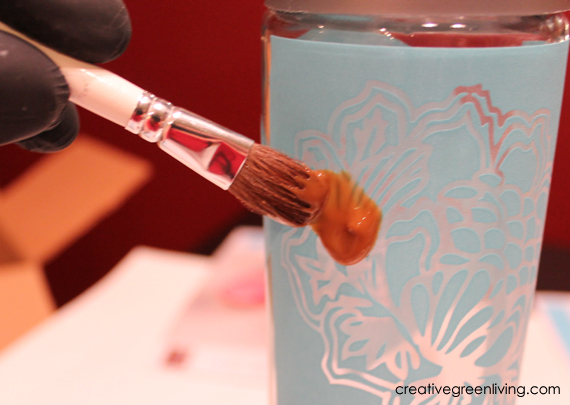 Scoop some glass etching cream out of the bottle and glob it onto the silkscreen. Continue globbing cream onto the silkscreens until all the design areas are covered. Be careful not to let any get on areas of glass you do not want etched. Rinse your brush while your gloves are still on. Remove gloves and set brush and bottle aside for 15-20 minutes or time indicated on the label. After your glass water bottle has had a chance to sit with the etching cream on it for 20 minutes, put your gloves back on and head over to a sink to rinse. (I used the bathroom sink to avoid any over-splash onto dishes or items that might come in contact with food). You could alternatively use a dishwashing tub filled with water if you don't have easy access to running water. Once the glass water bottle is rinse, run the silkscreens under the water and rub with your gloved hand to remove all etching cream. 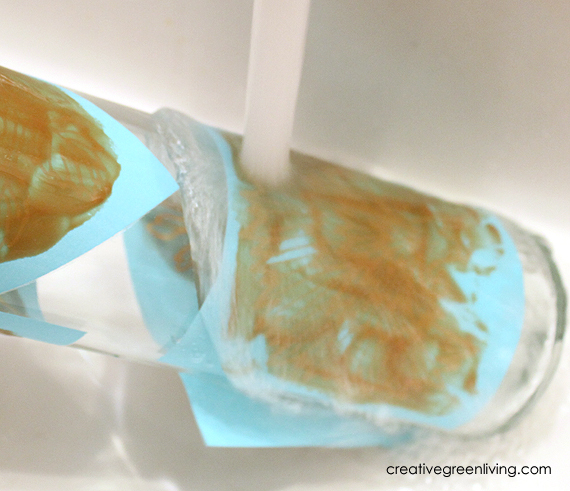 Place the rinsed silkscreens adhesive side up to dry and you will be able to use them again on a future project! Once all the traces of etching creme are gone from the bottle, gently wash the outside with mild soap and water and set aside to dry. If you want to keep adding more etched designs to your glass water bottle, now is the time! 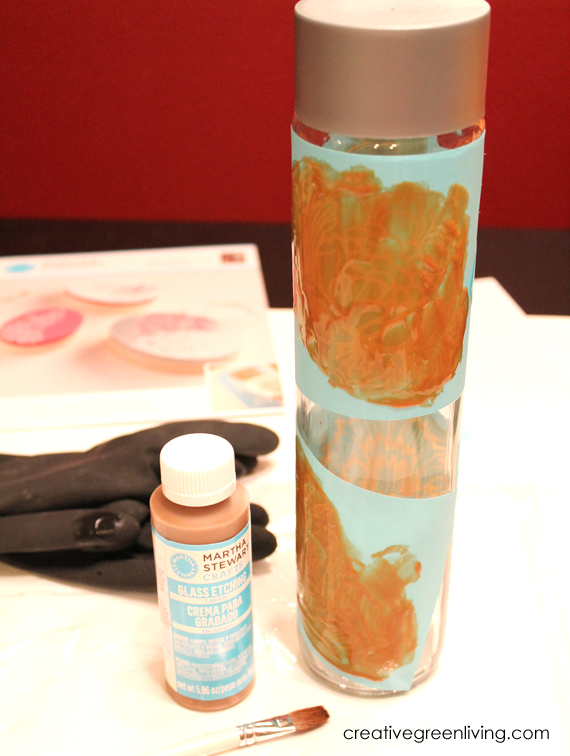 Once my bottle was dry, I added more small silkscreens in between the larger designs so that the bottle would be completely covered in etched glass designs. Once your bottle is clean and dry, it's ready to use! My sister got hers for her birthday but I think this is a great gift idea for Christmas or any occasion. And you can't beat the price! These water bottles sell for $20 or more in stores and online. I paid $3 for the Voss glass water bottle. The bottle of etching cream will last you through probably 50 or more projects, so really the cost to make just one water bottle was only about $4 because I already had the adhesive silkscreens on hand. If you love this recycled DIY water bottle project, be sure to pin it to save it for later! so cute! I may have to try that with some of the glass jars I use in the pantry. I bet it would make a cute label. I've always wanted a glass water bottle but I am too afraid I will drop it! This is so pretty, and I use water bottles all the time. 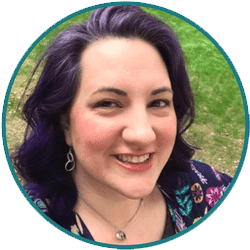 Thanks so much for sharing the step-by-step! Ooh what a great idea- I love it! I would also love to link to your directions in an upcoming Daily DIY if you didn't mind. Thanks, Rachel. That sounds great! What a great idea! You could even do names and initials to keep the glasses straight. What a fun idea! I love the idea of filling the bottles with something else - two gifts in one! I ordered a 24 count of glass Voss water bottles on Amazon for $66. I'm in the process of etching them now. Then I will fill them with a flavored liquor, and the gift tags will hold a drink recipes. Christmas gifts for every coworker for under $120. I'm edging their initials on to the bottles too. Great idea thanks for the inspiration! So glad I ran into this idea! Just happend to get "stuck" with two cases of Voss Glass Water Bottles and the silk screen label was keeping me from trying anything with them, but ill be getting etching supplies this weekend. Any thoughts on how 'green' the etching creme is? The main ingredient that etches the glass is Ammonium Bifluoride. It is not known to cause cancer or other reproductive harm, although it is an irritant to the eyes, lungs and skin so care should be taken while using it - wear gloves and work in a ventilated area. It is 100% solvable in water. For a project like this, you are using a small quantity and I am personally unconcerned about run off from it into the sewer. If you want to make a very large project, I would consider first scraping what you can off the glass and putting it back in the bottle and THEN rinsing it. I just finished making mine with peacock feather silkscreens. It's so pretty. I've been wanting to do something with one of these bottles for some time now. Thanks for the post! Can you use other stencils or does it have to be the silkscreen kind? I think the silkscreen kind work the best. If you had other ADHESIVE stencils you could probably do it but it will not work well with normal stencils. where did you get the mini razor scraper? Can you etch a casserole dish? Maybe on the outside? Absolutely! Exact same technique. 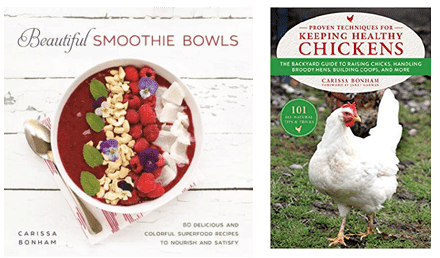 Just be sure to etch the outside and none of the surfaces where food would touch. This is the most beautiful glass I have ever seen. The fact that it is a water bottle is just that more of a bonus! Being able to order a case of bottles is also a fab idea! Thank you for sharing this idea with us all. Considering today is Christmas eve, its too late for me to make them this year but guess what my friends and family are getting for their birthdays all throughout the year???? The one from Walmart will probably work but I can't guarantee it as I've never used it myself. Be sure to read the instructions on the container and default to the manufacturer's instructions over mine if they disagree at any point. I am working on centerpieces for a Jr. Prom using recycled VOSS bottles. I read online to soak the bottles in vinegar and the wording will come off easier. It worked!!! Just 20 minutes in vinegar and then scrape off. That's a great tip! Thanks for sharing. I'm a bit accident prone with sharp objects like razors. So I have found one of the best ways to remove painted on labels fron glass is to use either nail polish remover or a solvent/lubricant like WD-40. Comes off fairly easily. Then you can use rubbing alcohol to clean the glass before etching. Also, sometimes the cream doesn't etch very well if you just let it sit while you wait. You have to "move" it around with a sponge pouncer brush every couple of minutes to get a really good etch. If you get a light hold adhesive spray, you can use whatever you want as a stencil. Cut out a stencil with a cricket or cameo machine. The plastic sheet from inside a package of bacon works great for this purpose. Those are all great tips! I taught a mini class on how to make these a few months ago and the bottles had adhesive labels on them instead of silkscreened paint. The labels just peeled right off, so if you can find bottles with labels instead of paint then you can skip that part alltogether. 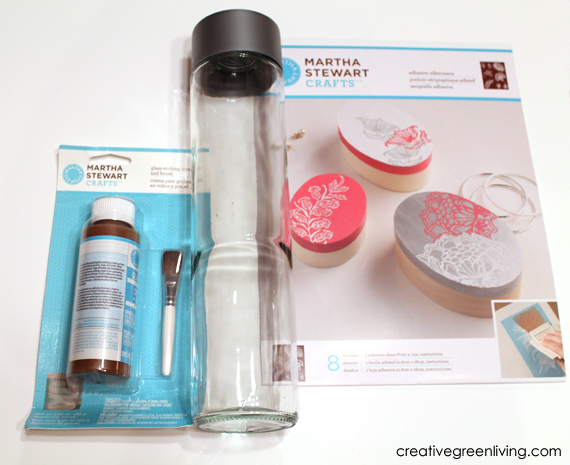 I've not had an issue with the Martha Stewart etching cream needing to be moved around but I have found that to be true with other brands so if you use a different brand, it wouldn't hurt to do that. That's the first time I've heard the suggestion to use bacon packaging that way but I love it! I have also made my own stencils with contact paper and that works quite well. I agree, contact paper is really great to use! And it can go through the cameo machine as well. So if you aren't great with an Xacto knife like me, it's a good way to get the stencil you want. I'll have to try the MS etching cream. I haven't used it before. By the way, WD40, or a non brand-name equivalent :), works really well with the adhesive gunk that can be left over on the glass. 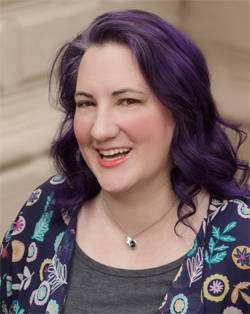 This article was really inspirational and I am definately going to be giving this a try! Thanks! Awesome piece of knowledge .Thank you admin.Really great article because this is helpful and i love this a lot. Wow! It's awesome tips to make different new. Thank you admin for great article. i love it so much. I haven't tried this on frosted glass. Since the cream basically frosts glass where it is applied, I don't think you would be able to see it. What might be interesting instead is to use the same silkscreen stencils I used here and apply a product like glossy Dishwasher Safe Mod Podge so you get a glossy vs frosted texture effect.